Upon first glance, Dwight would hardly seem a particular capable agent of revenge. Paunchy, pale and scraggly, wide melancholy eyes staring off towards some unknown horizon, he’s a shambling wreck of a man devoid of home or comfort, scrounging for food in carnival dumpsters and sleeping in his beat up blue Pontiac. He looks more like an aimless, broken drifter destined to die alone under his favorite pier, forgotten, than to cut a bloody swath across Virginia on a single-minded quest for brutal retribution. But, then, appearances can be deceiving. 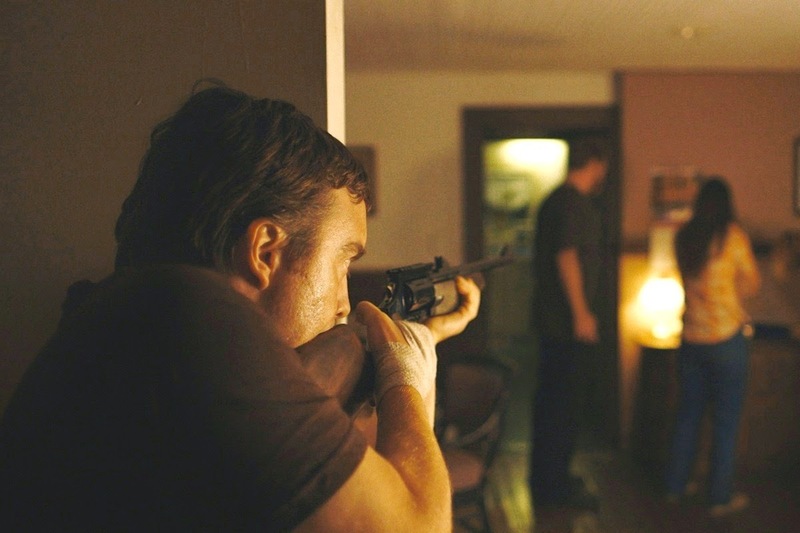 Dwight, played with haunted fragility by Macon Blair, is our guide through Blue Ruin, Jeremy Saulnier’s gripping and refreshing neo-noir character drama that presents one of the most unlikely eye-for-an-eye thriller yarns in quite some time. Originally pitched as “No Country for Old Men with an idiot at the helm,” this is actually a far more complicated and emotionally moving vision; an absorbing portrait of what happens when a very normal, unexceptional human being (no Anton Chigurh-like supernatural efficiency here) is driven by trauma into an inescapable violent existence. The results are messy, tragic, laced with pitch black humor and sadly poetic. When we first encounter our lead, he’s stuck in a morose, solitary holding pattern, waiting for… something. That something, we soon learn, is the impending release of the criminal who murdered his parents. Following the ex-con and his family to a roadside dive, Dwight sneaks into the joint’s bathroom and, trembling with anxiety, knife firmly in hand, prepares to strike. And thus kicks off Saulnier’s sad, stark, gore-spattered odyssey; a stunning work of tone and atmosphere, that stares directly into the heart of vengeance and discovers only emptiness, loneliness and despair. Visibly inspired by the Coen brothers, the writer-director, who previously helmed the 2007 festival hit Murder Party, has crafted a deceptively simple, stripped down meditation of a film that encourages us to dive headlong into the scarred psyche of its protagonist. This is an observant, personal story of unfortunate self-destruction, which nevertheless also manages the difficult task of driving the viewer uncomfortably close to the edge of their seat during several brilliantly-constructed sequences of unbearable suspense. Because Dwight is a beginner at this sort of thing, Saulnier skillfully milks endless tension from each and every deadly encounter he wanders into. After all, lacking any professional training or hands on experience, he’s prone to clumsy mistakes and misjudgments, such a sensational moment where a late night stake-out in an enemy’s house is thrown totally out of whack by a light getting turned on. Or, even more impressive, the slowly unfolding disaster that occurs during an interrogation at gunpoint wherein a dangerous captive (Kevin Kolack), newly freed from our hero’s trunk, quickly proves just how much cannier he is than his nervous rifle-wielding abductor. Tossing aside his handbook of standard tropes, the director shows a bold willingness to mine invention from every one of his standard genre set-ups, packing this lean, 90-minute exercise with countless small surprises that are exponentially magnified by the intimacy of the scope. It’s also crucial to emphasize just how beautiful Blue Ruin is to look at. The helmer, who has spent over a decade working as a cinematographer, shows a sharp eye for gorgeously-framed, evocative shots. Working with resources far more modest than several of this year’s most visually exciting low-budget films – Under the Skin, Only Lovers Left Alive and Enemy, to name a few – Saulnier works wonders with precious little, imbuing his Virginia locations with shabby mythic grandeur, and fills the screen with cool and arresting blue imagery. You could freeze frame at almost any time during this picture and be blown away by the compositions. 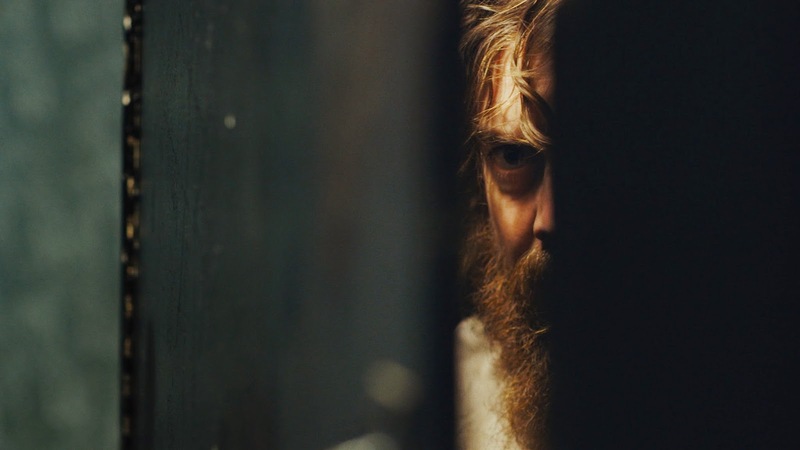 As wonderfully constructed as Blue Ruin is, however, all would be for naught without the right talent in the central role. This is largely a one-man show, and Blair is a true discovery; a shlumpy, self-conscious everyman (think Michael Shannon’s sad-sack little brother) whose innocent puppy dog eyes mask a soul darkened by unspeakable horror. Speaking in short bursts – if at all – Blair holds our attention throughout, drawing our unreserved sympathies and inspiring silent screams of warning when Dwight stumbles into a bad situation. He’s a heartbreaking, pitiful creature hiding behind a wall of mournful isolation so impenetrable even his sister Sam (Amy Hargreaves) and old friend Teddy (Devin Ratray) can no longer connect with him on a human level. And, thanks to the actor’s immense efforts, he’s also a true, unforgettable original. Given the profound strength of this material, it’s kind of shocking we haven’t seen a similar crime thriller tale told in this fashion before. Perhaps, though, that’s the genius of the picture; its clever premise is communicated so plainly and expertly it all just feels natural, obscuring the brilliance of the masterminds pulling the strings. 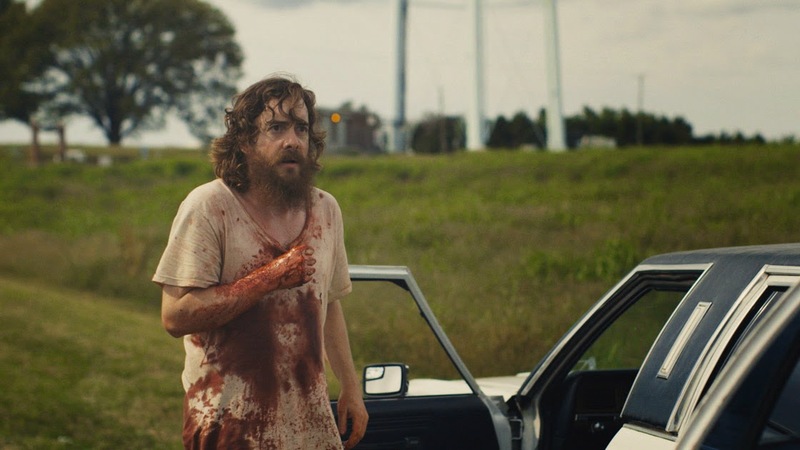 Poignant and intense, Blue Ruin heralds the arrival of two bold new creative voices and, unlike Dwight, hits the mark with every ringing pull of the trigger. 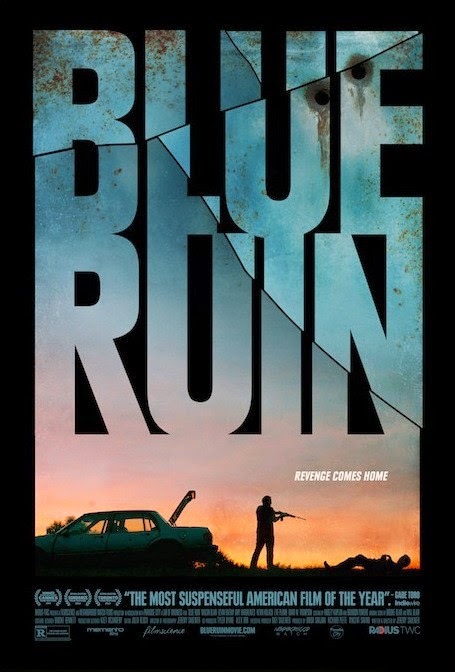 *Blue Ruin is available on VOD and DVD/Blu-ray now!